Behold the Handmaid of the Lord | Fr. Francis J. Connell C.SS.R. Today is also the historical feast of St. Dismas, the good thief and St. Margaret Clitherow, wife and mother who was one of the English martyrs. A tradition, which has come down from the apostolic ages, tells us that the great mystery of the Incarnation was achieved on the twenty-fifth day of March. It was at the hour of midnight, when the most holy Virgin was alone and absorbed in prayer, that the Archangel Gabriel appeared before her, and asked her, in the name of the blessed Trinity, to consent to become the Mother of God. Let us assist, in spirit, at this wonderful interview between the angel and the Virgin: and, at the same time, let us think of that other interview which took place between Eve and the serpent. A holy bishop and martyr of the second century, Saint Irenaeus, who had received the tradition from the very disciples of the apostles, shows us that Nazareth is the counterpart of Eden. In the garden of delights there is a virgin and an angel; and a conversation takes place-between them. At Nazareth a virgin is also addressed by an angel, and she answers him; but the angel of the earthly paradise is a spirit of darkness, and he of Nazareth is a spirit of light. In both instances it is the angel that has the first word. 'Why,' said the serpent to Eve, 'hath God commanded you, that you should not eat of every tree of paradise?' His question implies impatience and a solicitation to evil; he has contempt for the frail creature to whom he addresses it, but he hates the image of God which is upon her. See, on the other hand, the angel of light; see with what composure and peacefulness he approaches the Virgin of Nazareth, the new Eve; and how respectfully he bows himself down before her: 'Hail, full of grace! The Lord is with thee! Blessed art thou among women!' Such language is evidently of heaven: none but an angel could speak thus to Mary. Scarcely has the wicked spirit finished speaking than Eve casts a longing look at the forbidden fruit: she is impatient to enjoy the independence it is to bring her. She rashly stretches forth her hand; she plucks the fruit; she eats it, and death takes possession of her: death of the soul, for sin extinguishes the light of life; and death of the body, which being separated from the source of immortality, becomes an object of shame and horror, and finally crumbles into dust. Never was there a more entire or humiliating defeat than that which this day befell satan. The frail creature, over whom he had so easily triumphed at the beginning of the world, now rises and crushes his proud head. Eve conquers in Mary. God would not choose man for the instrument of His vengeance; the humiliation of satan would not have been great enough; and therefore she who was the first prey of hell, the first victim of the tempter, is selected to give battle to the enemy. The result of so glorious a triumph is that Mary is to be superior not only to the rebel angels, but to the whole human race, yea, to all the angels of heaven. Seated on her exalted throne, she, the Mother of God, is to be the Queen of all creation. Satan, in the depths of the abyss, will eternally bewail his having dared to direct his first attack against the woman, for God has now so gloriously avenged her; and in heaven, the very Cherubim and Seraphim reverently look up to Mary, and deem themselves honored when she smiles upon them, or employs them in the execution of any of her wishes, for she is the Mother of their God. This feast is very important in the defense of the life of unborn children. Even with small children, this is a good day to begin teaching about the high value God places on human life. He loved us so much that he became one of us, took on our human nature and became an innocent, completely dependent infant. 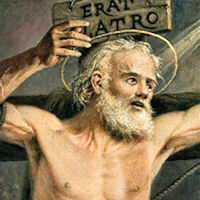 This is a Solemnity, so when this feast falls during the Lenten season, our Lenten penance obligations are lifted. We should celebrate by some special food or dinner. This feast day forecasts the blessed event of Christmas, and illustrates how the liturgical year is an endless circle of days. To celebrate this circle or cycle, serve a cake, coffee rings, or wreath-shaped cookies, or foods shaped in ring molds for this feast day. A perfect symbolic food would be an angel food cake for the archangel Gabriel, baked in a tube pan for the endless circle, decorated with the frosting highlighted with blue for Mary. A traditional food for this day is waffles. "Lady Day" or Annunciation, is the only feast of Mary that Sweden still celebrates since the Lutheran faith became the state religion in 1593. In most of Europe, waffles are a traditional feast day food, but on the feast of the Annunciation in Sweden this is THE "Waffle Day" (Vaffeldagen), where waffles are served either for breakfast, lunch or dinner, with lingonberries or cloudberries. .
And one of the malefactors which were hanged railed on him, saying, "If thou be Christ, save thyself and us." But the other answering rebuked him, saying, "Dost not thou fear God, seeing thou art in the same condemnation? And we indeed justly; for we receive the due reward of our deeds: but this man hath done nothing amiss." And he said unto Jesus, "Lord, remember me when thou comest into thy kingdom." And Jesus said unto him, "Verily I say unto thee, today shalt thou be with me in paradise." 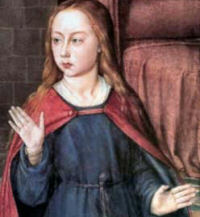 St. Margaret is considered the first woman martyred under Queen Elizabeth's religious suppression. 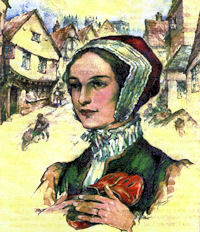 Margaret was raised a Protestant but converted to Catholicism about two to three years after she was married. According to her confessor, Fr. Mush, Margaret became a Catholic because she "found no substance, truth nor Christian comfort in the ministers of the new church, nor in their doctrine itself, and hearing also many priests and lay people to suffer for the defense of the ancient Catholic Faith." Margaret's husband, John Clitherow, remained a Protestant but supported his wife's decision to convert. They were happily married and raised three children: Henry, William, and Anne. She was a businesswoman who helped run her husband's butcher shop business. She was loved many people even her Protestant neighbors. Margaret practiced her faith and helped many people reconcile themselves back into the Catholic Church. She prayed one and a half hours every day and fasted four times a week. She regularly participated in mass and frequently went to confession. When laws were passed against Catholics, Margaret was imprisoned several times because she did not attend Protestant services. Other laws were passed which included a 1585 law that made it high treason for a priest to live in England and a felony for anyone to harbor or aid a priest. The penalty for breaking such laws was death. Despite the risk, Margaret helped and concealed priests. Margaret said "by God's grace all priests shall be more welcome to me than ever they were, and I will do what I can to set forward God's Catholic service." Margaret wanted her son Henry to receive a Catholic education so she endeavored that her son be sent outside the Kingdom to Douai, France for schooling. Such an act was considered a crime. When the authorities discovered their intention, the Common Council had the Clitherow house searched. They initially found nothing but later retrieved religious vessels, books and vestments used for Holy Mass. They also found a secret hiding place but no renegade priests. Still, Margaret was arrested. Margaret refused to plead and to be tried saying, "Having made no offense, I need no trial." English law decreed that anyone who refused to plead and to be tried should be "pressed to death." So on the morning of March 25, 1586, after sewing her own shroud the night before and after praying for the Pope, cardinals, clergy, and the Queen, Margaret was executed. She lay sandwiched between a rock and a wooden slab while weights were dropped upon her, crushing her to death. She did not cry out but prayed "Jesu, Jesu, Jesu, have mercy upon me." She died at age 30. Moved by her saintly life, all her children entered the religious life. Anne became a nun. Henry and William both became priests. On October 25, 1970, Pope Paul VI declared Margaret a saint. The Station is in the church of St. Mark, the full official name San Marco Evangelista in Campidoglio, St. Mark the Evangelist at the Capitol, which was built in the fourth century in honor of the evangelist, by the holy Pope Mark, whose relics are kept there. This was the one of the oldest churches constructed. The church has undergone several reconstructions and restorations, including a heavy Baroque restoration.